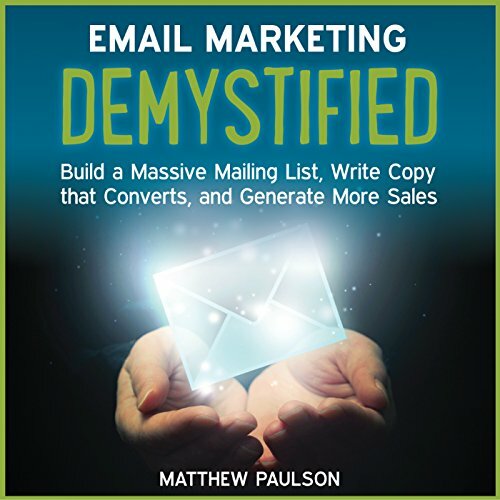 Matthew Paulson has organically grown an email list of more than 275,000 investors and generates more than $1 million per year in revenue using the strategies outlined in Email Marketing Demystified. Regardless of what kind of business you are building, email marketing can serve as the rocket fuel that that will skyrocket your business. I am a digital marketer for a profession and this book was wonderful. It covered more than just the basics. It also gave a ton of resources and tool recommendations. Be sure when you buy this book that you have a pen and notepad ready. You will be writing notes during the entire book. Thank you Matthew Paulson for writing this. Has Email Marketing Demystified turned you off from other books in this genre? I'm sure this would be good for someone who had no idea about email marketing. This book is definitely not for someone who is already using email marketing in their business, it is for someone who's brand new to it as it goes over (in long drawn out detail) the very basics of email marketing. I listened to most of it hoping to get some tips or techniques that I didn't already know about, but didn't ever get any. I feel it is a waste of time for those people who are looking to up their game in email marketing. However, if you're brand new to this, I think it would be helpfu to you. Would you consider the audio edition of Email Marketing Demystified to be better than the print version? Awesome tips and tricks for any new business. Highly recommended! Gave me new ideas and ways to grow and monetize a list. I think the material, ideas and recommendations presented are certainly helpful and useful. However, as an employee of a larger company, I cannot utilize many of the tactics described in the audio book as I do not have any control or say over our website and how we market it. I was really hoping for an audiobook that was strictly about 'email marketing'... something I do have control of in my current role. Otherwise, good info for the bigger picture. Would have been better to name the audiobook 'Email & Website Marketing Demystified'. This resource gave me actionable steps that made sense to me. it was well worth my time. I'm new to email marketing but was amazed by the step by step provided in this book that takes you through to start your email marketing campaign. Highly recommended to listen or read. Good place to learn about email marketing and process . Good tips and examples of available tools and courses of information online .